New officers were elected at the January 17 meeting of the Alabama Forestry Commission (AFC) at state forestry headquarters in Montgomery. 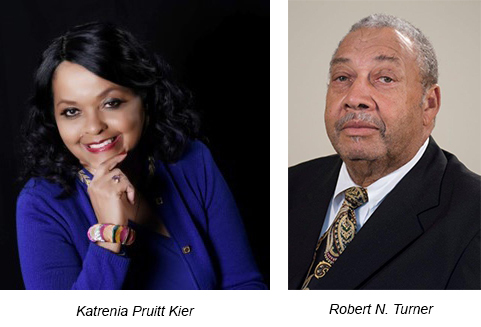 The board selected Katrenia Pruitt Kier of Huntsville as new Chair, and Robert N. Turner of Sulligent as Vice-Chair. Both Kier and Turner have served on the Commission since February 2016. With over 30 years of professional experience in business management, corporate training, and customer service, Katrenia Kier is the owner of Kier Realestate, LLC, a real estate brokerage firm in Huntsville. Her prior corporate experience includes human resource and information management positions in the defense industry at McDonnell Douglas and Boeing Corporation. Currently an officer with the National Association of Real Estate Brokers (NAREB), she also serves as minister and youth committee coordinator for the Greater Huntsville Interdenominational Ministerial Fellowship. She earned a Bachelor of Science in Psychology from Case Western Reserve University in Cleveland, Ohio, and received a Business Management Certificate from the University of Alabama at Huntsville as well. Kier previously served six years on the State Forester’s Outreach Advisory Council for underserved and minority landowners. In addition to completing master forester classes and training on best management practices for forestry, she has also attended forest industry conferences and coordinated workshops for North Alabama landowners, introducing them to services offered by the Forestry Commission. After a 45-year career in the field of education, Robert Turner now stays busy with cattle and farming in Lamar County. Upon completion of a Bachelor of Art degree in Social Studies at Mississippi Industrial College, he attended Rust College, University of Alabama, University of Mississippi, and Mississippi State University, receiving a master’s degree in Administration in 1984. Over the years, he served as teacher, coach, assistant principal, and principal at Caledonia High School in Shugualak, Mississippi. He then worked as Director of Transportation & Maintenance for the Lowndes County (Mississippi) School District and later in Natchez, Mississippi, before returning to Alabama where he spent several years in the same position in Lamar County prior to his retirement in 2011. Turner’s organizational memberships have included the State Forester’s Outreach Advisory Council for underserved and minority landowners, Executive Committee of the Alabama TREASURE Forest Association, and chairman of LRLEAN (Limited Resource Landowner Education & Assistance Network) an association of African American landowners organized to promote increased sustainable forestry management/certification in the Black Belt region of Alabama by working with the Sustainable Forestry Initiative/Tree Farm program. This organization has also connected many Black landowners to USDA financial assistance programs. Other members of the AFC Board of Commissioners include immediate past Chairman Jane T. Russell of Lapine; Jerry M. Dwyer of Auburn; Stephen W. May, III of Sawyerville; Dr. Bill Sudduth of Tuscaloosa; and Joseph H. Twardy of Auburn. This seven-member board, appointed by the Governor and approved by the State Senate, is responsible for setting policy for the Alabama Forestry Commission, the state agency charged with protecting and sustaining Alabama’s forest resources. To learn more about the AFC, visit www.forestry.alabama.gov.